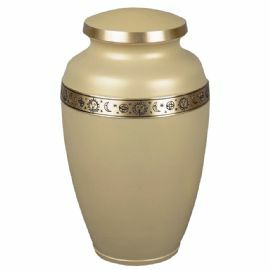 This is a full-size single urn and is designed to hold the cremains of a person having a total body weight of up to 208 pounds prior to cremation. The Venus brass cremation urn is crafted in the shape of a classic vase with a golden sand enamel finish and an astrological sun and crescent moon band. It has a threaded, top-opening lid.